We are Manufacturer & Exporters of Carbon Steel ASTM A53 Grade A Seamless Pipe, Carbon A53 Gr.A ERW Tube, Carbon Steel A53 Grade B Welded Pipe Supplier in India. Our range of Carbon Steel ASTM A53 Grade A, ASTM A53 Grade B Tubes are used in different industries for diverse applications, these pipes can be availed in standard as well as customized dimensions as per the requirement of the clients. We offer Carbon Steel A53 Pipes & Tubes in excellent condition and in seamless & welded pipes forms for export and local purpose. These ASTM / ASME A53 Gr. A/B pipes & tubes are ergonomically designed and developed in accordance with world class standards. We produce carbon steel pipes and carbon steel welded pipes, carbon steel welded tubes and electro galvanized steel tubes/pipes. Carbon Steel A53 GR.A/B ASTM / ASME Pipes & A53 Tubes are used in the most critical engineering applications and also in certain applications in the automotive sector. We manufacture & export Astm / Asme A53 Gr. 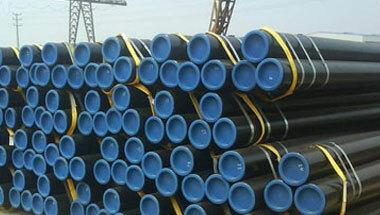 A & B carbon steel pipes & tubes in various dimensions and sizes and as per valued customer’s requirements. ASTM A53 ERW Pipes, A53 Carbon Seamless Tubes, Carbon A53 Gr A Welded Pipes, A53 ERW Pipe, ASTM A53 Gr B Seamless Carbon Pipes Manufacturer in India.